Customer journey maps are a popular visual artifact for documenting or modeling an archetypal user’s experience with a brand, product, or site, but they are more than just a pretty deliverable. When they are based on solid evidence, journey maps become a valuable planning tool for user experience-related work, with implications for information architecture, information models, taxonomies, and beyond. Record places of interest, and document the current state of the landscape. Serve as a source of learning more about a particular place – its topography, its landmarks, its political divisions. Provide a sense of the space, where you are in it, and where you can go. Record situations of interest, and document the current state of the experience. A customer journey map can document what is currently happening, so you know where you stand. They can also document the ideal state of what should be happening, so you know what you want the experience to be. At their core, they document the landscape of the journey. To do this effectively, you must have evidence of what is happening. Serve as a source of learning about that experience. Customer journey maps must include some layer of analysis on the journey, to help you understand why things are happening, where gaps in the experience exist, where you can improve the experience, and where you are doing a great job of serving user needs. To get to this point, you need to conduct rigorous analysis of your user research evidence. Provide a sense of the space, where you are in it, and where you can go. Customer journey maps should also include a layer of implications and solutions for problem areas. It’s not very useful to know where you’re falling short in the experience if you don’t also identify what you can do to close the gap. To get here, you need to translate your implications from user research findings into actionable solutions. Valuable customer journey maps are based on evidence from user research. Well-defined research objectives. What is it you want to know at the end of this study? This sets the stage for the types of questions you ask or scenarios you seek to observe in order to understand your customer’s journeys with your brand. Identify the scenarios you want to understand more about, and which behaviors or needs you want to investigate. Appropriate participant recruitment. What are the defining characteristics of the customers we need to learn about in order to fulfill our research objectives? Talking to the wrong people will get you the wrong information for your current needs, and can set you down a path that leads to poor conclusions down the line. Identify which customer segment you prioritize over others, and target participants who fit those characteristics. Obsessive notetakers and observers. Garbage in, garbage out. The next step, rigorous analysis, depends solely on the quality of evidence gathered in the form of notes and observations, so this has to be accurate and thorough. Make sure your research team has a system for note-taking and observing that allows for detailed gathering of evidence. And because every research program is unique, be sure your research team is in the habit of continuously re-examining and refining their systems for observing and documenting research sessions. Thoughtful and rigorous analysis. A valuable customer journey map documents actions, behaviors, and motivations behind behaviors. It can also illustrate the mental models your users hold about your site or product, and the information needs and information-seeking behaviors they express in relation to your site or product. Analysis that is grounded in a rigorous framework of evidence-seeking is crucial to getting to this level of insight. The analysis should produce hypotheses about mental models and information behaviors. Make sure your research team has the experience to be able to complete this level of analysis. Clear translation from findings to implications to actionable insights. Translating observations about user needs and behaviors into a set of solutions is what makes a customer journey map truly valuable. In this way, the map not only documents what is happening for your customers, but also illustrates a path forward for you and your stakeholders, and helps you identify and prioritize the work that needs to be done to improve the customer experience. Make sure your research team has the depth of knowledge about information architecture, taxonomy, content strategy, and the like, to translate appropriately for your needs. 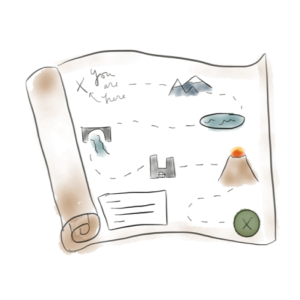 Like any good geographic map, customer journey maps are only valuable when they are accurate, insightful, and allow the reader to act upon what they learn. By using an evidence-based approach to creating a customer journey map, the map goes beyond a simple depiction of the experience and becomes a valuable decision-making and planning tool for improving your customer experience.